NETWORK FINALS: NBC and CBS were weirdly full of 0.1 declines in final numbers: respectively for both episodes of FAM and the reruns of THE BIG BANG THEORY and SWAT; and for SUPERSTORE, AP BIO, WILL & GRACE and SVU. In addition, for the 2nd consecutive week, FOR THE PEOPLE lost 0.1. CABLE HIGHLIGHTS: Basketball continues to exert a hold on viewers. On the college side, ESPN’s coverage of the ACC TOURNAMENT was at 0.93/0.48, with a PAC 12 game at 0.33. TNT, meanwhile, aired an NBA doubleheader at 0.40/0.37. A&E’s 60 DAYS IN dipped 0.06 to 0.41. On MTV, EX ON THE BEACH gained 0.04 to 0.38, and GAME OF CLONES lost a tick to 0.16. On History, SWAMP PEOPLE rose 0.06 to 0.35, and TRUCK NIGHT IN AMERICA was up 0.07 to 0.26. 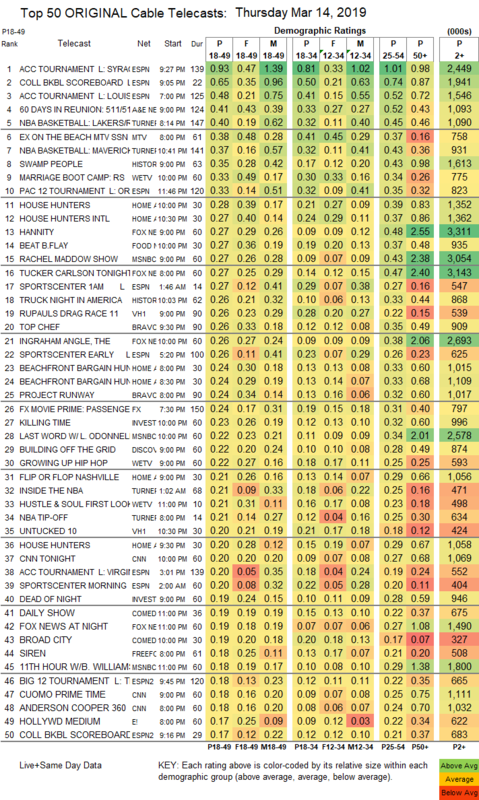 On We, MARRIAGE BOOT CAMP climbed 0.04 to 0.33, and GROWING UP HIP-HOP was down 0.02 to 0.22. On HGTV, HOUSE HUNTERS edged up 0.02 to 0.28, HOUSE HUNTERS INTL lost 0.02 to 0.27, and FLIP OR FLOP ticked down to 0.21. Fox News’s HANNITY tied for the cable news 18-49 lead at 0.27/0.48/3.3M, with MSNBC’s RACHEL MADDOW SHOW at 0.27/0.43/3.1M, and CNN TONIGHT at 0.20/0.27/1.1M. Food Network’s BEAT BOBBY FLAY was up 0.02 to 0.27. On VH1, RUPAUL’S DRAG RACE slipped 0.02 to 0.26, and UNTUCKED was down 0.02 to 0.20. On Bravo, the season finale of TOP CHEF dropped 0.06 to 0.26, and the season (and network) premiere of PROJECT RUNWAY was at 0.24. On ID, KILLING TIME ticked down to 0.23, and DEAD OF NIGHT ticked down to 0.19. Discovery’s BUILDING OFF THE GRID grew by 0.07 to 0.22. On Comedy Central, BROAD CITY gained 0.03 to 0.19, and THE OTHER TWO ticked down to 0.11. Freeform’s SIREN rose 0.02 to 0.18. 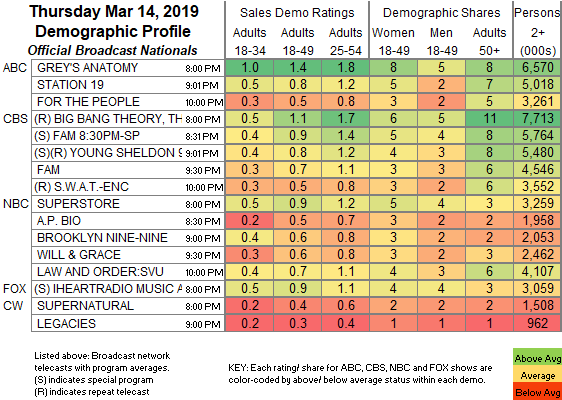 E!’s HOLLYWOOD MEDIUM was steady at 0.17. On Lifetime, BRING IT dropped 0.03 to 0.15, and THE RAP GAME aired a special that was down 0.09 from last week’s regular episode to 0.12. FX’s BETTER THINGS was up 0.02 to 0.13. Off the chart, Showtime’s DESUS & MERO fell a tick to 0.02/32K, and POP’s FLACK was steady at 0.01/52K.